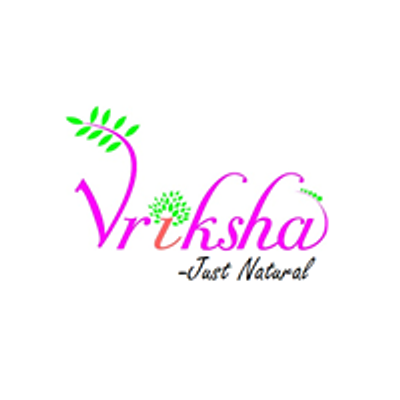 Workshop by Vriksha-Just Natural@ The Vivaah, GN Chetty Road, Chennai on MArch 30 & 31, 2019. 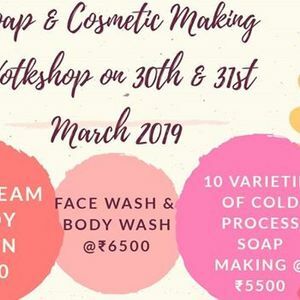 The workshop is a hands-on class which will explain you every aspect of cold process soap making and How to formulate soap based on skin type . No prior experience is needed in soap making. You will be taught to make the following soaps. You will be explained in details on how to use oils , butters, Fruits and Vegetables in your soap and to formulate your own recipe without using chemicals. By attending this workshop , you can not only make natural soaps for your family and friends but also be an entrepreneur . There is huge market for organic handmade soaps. 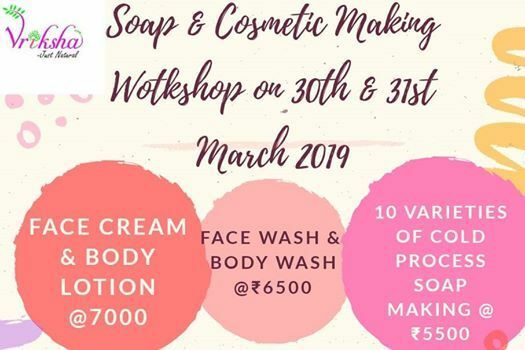 Face Cream and Body Lotion Workshop (Rs.7000) & Face Wash and Body Wash Workshop (Rs.6500) is a hands-on session where you will learn to formulate cream ,lotion,face wash and body wash for different Skin Types and how to customize based on skin problems like Acne Pimple,Pigmentation,Wrinkles ,Skin Glow and So On. All materials required for workshop will be provided along with lunch. Everyone who attends can take with them the soaps made in workshop. Any doubts or follow up will be provided post workshop.